There I am, jamming the “close door” button repeatedly, while I whisper “come on, let’s go, go, go” over and over again under my breath, which has been stolen from me by the 50-yard dash that would make my 3rd grade gym teacher shake her head at. The short ride north passes as if time has applied the brakes to half speed, followed by the jolting “DING.” Without thought, I “shoooooosh” the elevator out loud, angry that it was intentionally bringing attention to my delayed arrival, and head for the conference room. The door…closed. The voices…muffled. One shoe…still in hand. No time to brush the hair from my face, to wipe the coffee splats from my arms, to bring my heart beat back to normal. I push the stainless steel door handle south and wince at the clicking sound which will certainly, and does, halt conversation while calling all eyes to my arrival. With a slight push, I inhale to flatten all that I can and slide in confident that the less I open the door, the less late I am. It doesn’t work, by the way. “I’m here, sorrysorry, hi-how-are-you, beautiful out today, amiright? whew made it. can I borrow a pen? hi, continue, sorry, hi.” And, with that, I made it. SO, that is pretty much how I feel about getting this recipe to you as we barrel on towards Easter. My first attempt at this was last year, yet I’m still tossing this at you just a few short days away from the holiday…but I made it (applicable to both my timing and literally, the bread). It has been difficult to consider posting a recipe for Easter when it’s still feather jacket weather here (mother nature better cut the crap already with spring snow), yet the sun is out today and it’s time to prepare. So iron all of those sleeveless dresses and button up shirts that you bought for the kiddies – fully knowing that it’s always 50 degrees (golf claps to that freezing spring wind) and muddy for this holiday and they are going to freeze their tushies off looking for those plastic eggs filled with the sugar highs that will haunt you for the remainder of the day (you’ll get pictures though…and if you photoshop out their bright red cheeks, grandma won’t call [skype now that it’s 2015] you to question your parenting skills… just make sure they warm up within 20 minutes. Also, btw, avoid Skype if you can…you’ll not only avoid the “looks” that come with the interrogation, but they won’t see all of the candy wrappers that you haven’t picked up off of the floor yet. cheers for technology). Anyway, back to the bread. 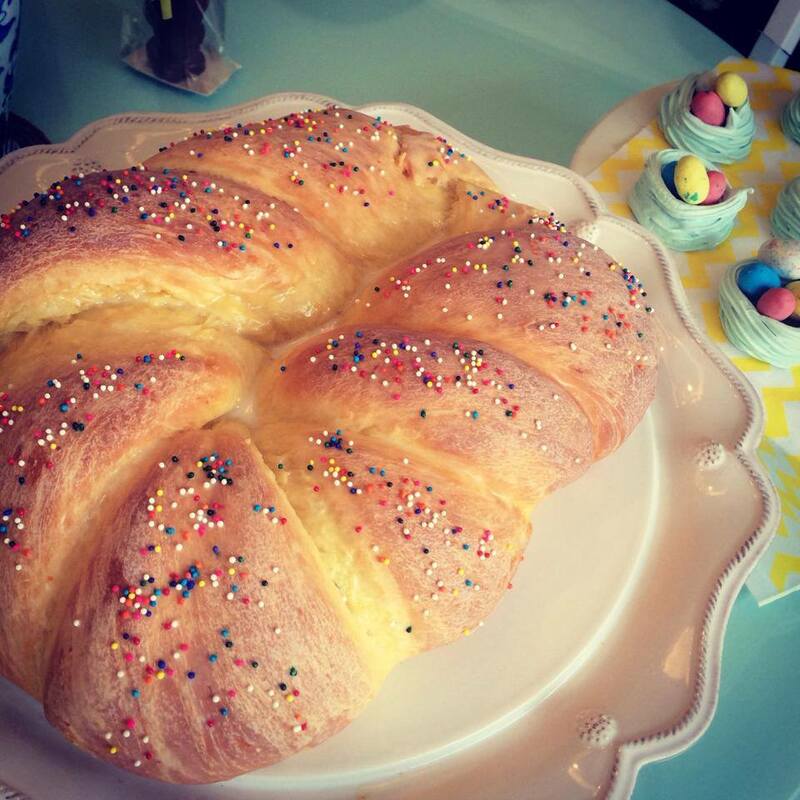 This is the perfect bread to bring to the holiday host’s home, as you usher the kiddies inside with your “it’s 11am…must find nearest mimosa gritted teeth smile” [hoping that they will finish all of the candies there and wipe their chocolatey sticky hands on someone else’s couches for once. disregard that if I’ve been invited to your home this year…]. 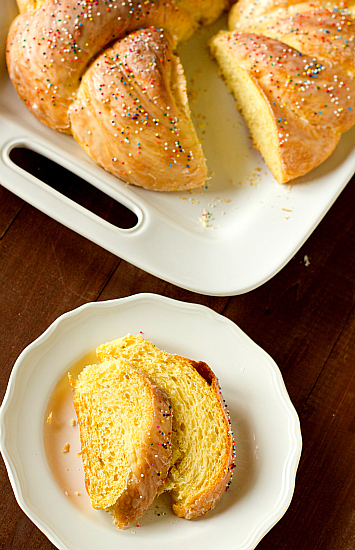 With a slight hint of refreshing spring orange, just enough sweet glaze, a professional looking “twist” and the obligatory non-pareils (eh, em… another word that rebels against “I before E, except after C”), this bread is a must. It also happens to be another one of those 2 for 1 deals… So grocery-store-it-up over the next few days and get bread making on Saturday night. Sounds wild, no? Bonus round: no one wants to hang around while you make bread, so you’ll be able to inhale at least 48 rows of peeps without anyone knowing. 1. Place the flour in a large mixing bowl; set aside. 2. Heat the milk in a small saucepan over low heat, stirring occasionally, until it is warm to the touch, but not hot. If you have an instant-read thermometer, the temperature of the milk should be between 110 and 115 degrees F.
3. While the heat is warming, place the sugar in a small bowl and add the orange zest. With your fingertips, rub the zest into the sugar until it is completely incorporated and the sugar is moistened. 4. Once the milk reaches the correct temperature, stir in the sugar and zest mixture, stirring to dissolve the sugar. Add the yeast, stir, and let sit for 10 minutes. 5. Add the milk and yeast mixture to the flour and begin to mix it into a dough (it will be shaggy at this point). 6. Next, add the melted margarine and continue to mix. Now, add the orange juice to the dough and mix to combine. 7. In a small bowl, use a fork to lightly beat together the eggs, salt, and anise oil. Add to the dough and continue mixing. 8. At this point, you may need to add more flour to the dough, depending on how much juice you get out of your oranges. I added quite a bit more to get the dough to come together. Once you have a sticky ball of dough formed, turn it out onto a floured surface and knead for about 5 minutes, or until the dough is soft and elastic. It will remain slightly tacky. 9. Place the dough in an oiled bowl, turning to coat, and cover the bowl loosely with plastic wrap. Place in a draft-free area and allow to rise until doubled in volume, about 1 hour. Meanwhile, line two baking sheets with parchment paper and set aside. 10. 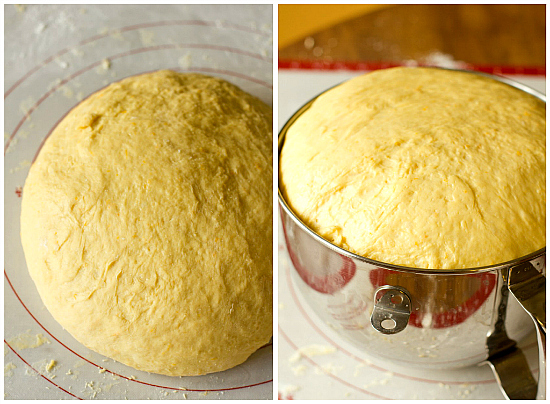 Turn the dough out onto a clean surface and divide in two. Divide each half into two (you will have four pieces of dough). We will work with one pair, and then the other. Roll two pieces of dough into 24-inch long ropes. Loosely twist the ropes together. Transfer the braided rope to one of the prepared baking sheets and bring the ends together to form a ring, twisting and pinching the ends together to seal. 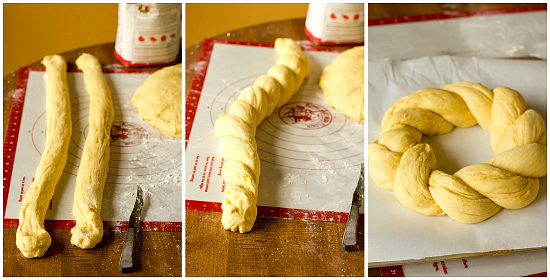 Repeat with the remaining two pieces of dough so that you have two circular, braided loaves. Brush the tops of each with melted butter, loosely cover with plastic wrap, and let rise until nearly doubled in size, about 45 minutes to 1 hour. 11. While the dough is rising, preheat the oven to 350 degrees F. Bake one at a time (unless you have the oven capacity to correctly bake both at the same time) until golden brown on top, 30 to 40 minutes. Remove from the oven and transfer to a cooling rack to cool completely. 12. Once the breads are cooled to room temperature, you can glaze them (if you desire). Whisk together the powdered sugar and the milk, adding more if necessary to reach the desired consistency. Use a pastry brush to brush the glaze onto the top and sides of the bread, and decorate with sprinkles (give the glaze a minute or two to set. NOT DRY, just set. Otherwise, the non-pareils will just start sliding down the bread and will leave weird color trails everywhere). The bread is best served at room temperature. If you have leftovers, wrap well in plastic wrap and store at room temperature for up to 3 days. *Photo credit to the original recipe site above. Once I make this weekend, I will replace with my own. 🙂 We’ll call it “semi-photo-made” for now.